A lot of people find it difficult to understand about V1 : whether its a decision speed or action initiation speed. Whats the significance of it ? * Safely go with in the takeoff distance available. * Safely stop with in the acceleration stop distance available. In either cases aeroplane uses all the distance available.V1 is a speed for a particular Take Off Mass and therefore varies with change in TOM( Take off Mass). 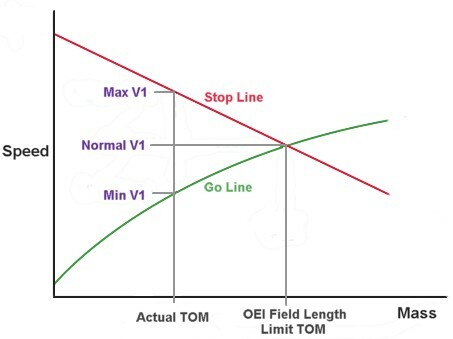 For a Field Length Limited Take Off Mass (FLTOM) there can only be one V1. For any Take Off Mass lighter than FLTOM there is a range of speeds/V1 between Vstop and Vgo. Vstop : If rejecting a take off Vstop is the fastest speed from which an aeroplane must be able to stop within the acceleration stop distance available. larger the ASDA faster the Vstop but for a given ASDA it comes down to Take Off Mass. Vgo : Vgo is the slowest speed from which a takeoff can be continued having just suffered an engine failure. Larger the TODA slower the Vgo. Therefore for a given TODA Vgo varies with TOM. Since Vstop and Vgo vary with a lot of factors and are not generally available/mentioned in aircraft’s performance manual. Therefore it is best to go with V1 as it gives a safety margin too. A pilot may reject a takeoff due to an engine or other major system failure but it is the engine failure situation that affects the ability to go due to due to large reduction in excess thrust. However both the engine failure and all engine operating (with other major system failure) situations must be allowed for in he stop case. If the engine failure is recognised before V1, the takeoff must be rejected. V1 means the maximum speed in the takeoff at which the pilot must take the first action (e.g., apply brakes, reduce thrust, deploy speed brakes) to stop the airplane within the accelerate-stop distance. V1 also means the minimum speed in the takeoff, following a failure of the critical engine at VEF, at which the pilot can continue the takeoff and achieve the required height above the takeoff surface within the takeoff distance. V1 is the Decision speed (sometimes referred to as critical engine speed or critical engine failure speed) by which any decision to continue or reject a takeoff must be made. In the recent years there have been a lot of incidents of rejected takeoffs and some of hem have had fatal results. And in all the incidents the non successful ones are generally the ones that were rejected near V1. Therefore the need of the hour is a more broader, largely accepted and well defined V1.